Sepsis is the body's overwhelming and life-threatening response to infection which can lead to tissue damage, organ failure, and death. Learn more about the symptoms of sepsis, which kills 258,000 Americans each year. Volunteering for Sepsis Alliance is a great way for people to become involved in the promotion of sepsis awareness. Discover ways to get involved. Participate in a local fundraising event. Check our community events listings to see if there is an event in your area. We are very grateful for all of your support! To find out more about how you can contribute to Sepsis Alliance, please visit our donation page. Visit the Sepsis Alliance FAQ for answers. Infections can develop anywhere in your mouth – in the gums (periodontal), lips, palate, cheeks, and tongue, or within and below teeth (endodontic). A dental infection, within or below a tooth, can be caused by tooth decay or a broken tooth that causes the pulp to become infected. The pulp is the part of the tooth that contains blood vessels, connective tissue, and large nerves. When an infection occurs, bacteria can move out of the tooth to the bone or tissue below, forming a dental abscess. A dental infection can lead to sepsis. Sometimes incorrectly called blood poisoning, sepsis is the body’s often deadly response to infection. Sepsis kills and disables millions and requires early suspicion and treatment for survival. Sepsis and septic shock can result from an infection anywhere in the body, such as pneumonia, influenza, or urinary tract infections. Worldwide, one-third of people who develop sepsis die. Many who do survive are left with life-changing effects, such as post-traumatic stress disorder (PTSD), chronic pain fatigue, organ dysfunction (organs don’t work properly) and/or amputations. As with all infections, an infection in your mouth should be treated as quickly as possible to reduce the risk of complications, including sepsis. Salt water mouth rinses while waiting to see your dentist may ease the pain or discomfort. If your dentist feels you have an infection, you will probably be given a prescription for an antibiotic. It’s important that you take this antibiotic as directed until it is finished, even if the pain and swelling seem to have gone away. Feeling better does not necessarily mean that the infection has gone away. Also, ask your dentist if the infection can be drained. If it is possible, draining can speed up the reduction of pain and swelling. Your dentist may refer you to an endodontist or periodontist if your case is more complicated. Preventing infections from occurring in your mouth will help you reduce your risk of developing sepsis. Regular twice-a-year visits are usually recommended for up-to-date x-rays, exams, and dental cleanings. Good oral hygiene is the first basic step to preventing infections. These habits should be taught to children from early on to help them keep healthy mouths and teeth. Brush your teeth thoroughly at least twice a day. Don’t over brush – brushing too hard or with too hard a brush can damage your teeth. Ask your dental hygienist for the best way for you to brush your teeth. Don’t use your teeth to open packaging, break string, etc. Your teeth are strong, but they are meant for chewing food, not hard objects, which can cause teeth to crack, chip, or break. Visit your dental office at least twice a year for a thorough cleaning and check up. If you have had dental work, watch for any signs of infection and contact your dentist if you experience any of the signs listed above. Dental work, from cleaning to root canals, may cause bleeding and an opening where bacteria can enter the body. While dentists, hygienists, and dental assistants work to keep everything as clean as possible as they do their work, sometimes infections do develop, just as sometimes they do after surgery on another part of the body. The American Dental Association recommends that certain people receive prophylactic or preventative antibiotics before they have dental work done. These are people who have certain heart conditions that could make them more prone to developing a condition called infective endocarditis. As well, it may be recommended that some people with artificial joints (like a knee or hip) take prophylactic antibiotics before dental work. If you have an artificial joint, speak with your doctor before you need dental work to see if this is recommended for you. Here are some of the most common dental procedures. Dentists try to avoid pulling teeth (tooth extractions), but sometimes it is the only option. Endodontic (root canal) procedures are preferable to extraction when possible. Antibiotics are not generally prescribed for a local abscess, although they may be if the infection is severe or the infection has spread, or for patients who have a compromised or weakened immune system. Too much damage to the pulp (within the tooth) from infection or decay. Gum disease that results in loose teeth that can’t be stabilized. Crowded mouth, before orthodontics (braces). Teeth that cannot be restored with a dental crown or restoration. 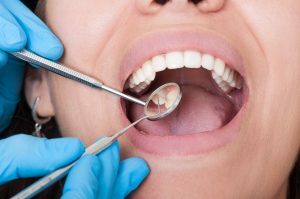 Tooth fillings are done when a cavity or hole in the tooth needs to be fixed. After cleaning out debris and dirt, the dentist inserts the filling material, which will then protect the tooth. If you have an infection or have had a root canal, the dentist may put in a temporary filling. A temporary filling protects the pulp from bacteria reaching it and usually helps relieve any pain that you may be feeling. Temporary fillings must be replaced with permanent fillings as they are not made to last. If your tooth is badly decayed or infected, your dentist may suggest that you have a root canal done before going to the more drastic step of extracting (pulling) the tooth. When a root canal is done, the nerve and the pulp are removed from inside of the tooth. That inner space is then replaced with a sterile inert (chemically inactive) material. The tooth is not “dead” as it has a nerve and blood supply around it. The information here is also available as a Sepsis Information Guide, which is a downloadable format for easier printing. Would you like to share your story about sepsis or read about others who have had sepsis? Please visit Faces of Sepsis, where you will find hundreds of stories from survivors and tributes to those who died from sepsis. Copyright © Sepsis Alliance. All rights reserved. 0 people are diagnosed with sepsis.